for interested individuals, families or groups. The original 1893 schoolhouse displays hundreds of original artifacts depicting immigrant turn-of-the-century life of families, businesses, and coal mines. Original items include the jailhouse iron doors, soccer trophies and bocce balls, coal mining tools, furniture and household items, old store supplies, Illinois coal reports, maps and plats, and plenty of family memories; there is something to interest everyone. A significant portion of the north room represents all the coal fields of Grundy and Will Counties, Illinois. In the south classroom you can sit at the desks, read through the old books, see photos depicting our classes and school history, 1893-1955. Three rooms are filled with photographs, artifacts, local memorabilia, kitchen, bedroom and store displays from "the old days," plus a diorama of Carbon Hill, in its mining heyday, circa 1900. 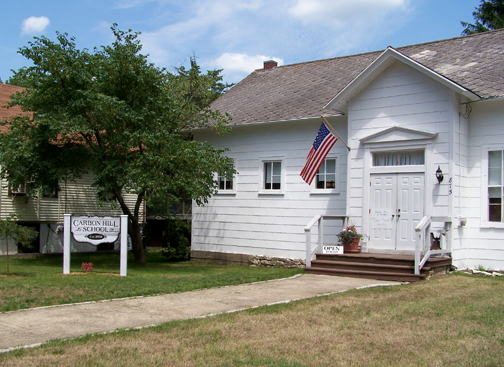 The Carbon Hill Historical Society, a chartered and registered not-for-profit organization, invites anyone interested in our museum and local history to visit and also to join our society, which owns the school and sponsors all of its programs. Please phone Michele Micetich, 815-347-0810 or email mmicetich@comcast.net for more information on programs, presentations, hours and appointments. Interested in a museum tour, a group visit, a public presentation, or membership in our society?